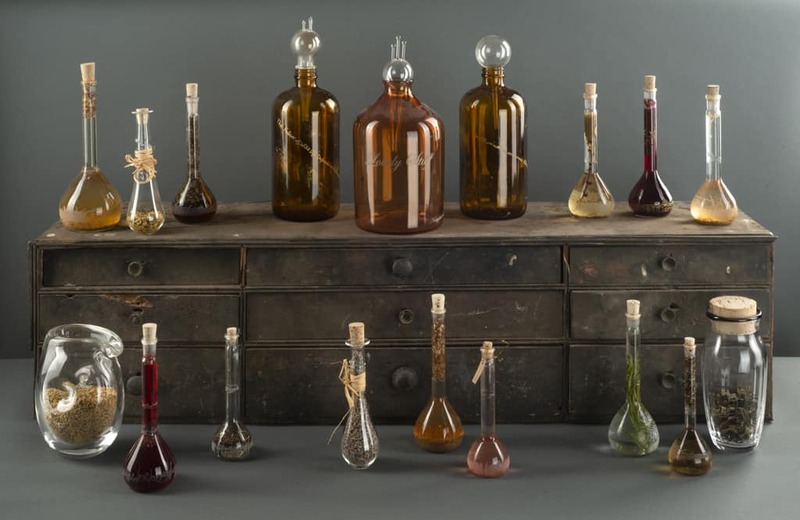 Apothecary features a series of handmade vessels and scientific glassware by Glasgow-based artist Siobhan Healy containing traditional herbal medicines and tonics. Shown at Gracefield Arts Centre in Dumfries for the first time, selected glass exhibits have text produced especially for the project by writer Alasdair Gray incorporated into the work. Siobhan also worked closely with Auchencairn-based herbalist Alex Ross to develop the apothecary herb collection. This new exhibition also includes some works from Siobhan Healy’s previous body of work – ‘Biodiversity’ (2018), which included contributions from Alasdair Gray, also a selection of contextual historical works by both artists. Siobhan Healy has received recognition for her work through prestigious awards winning the worldwide tri-annual competition – ‘ The International Glass Prize 2012’ – Public Prize. Healy specialises in glass commissions for public buildings and also sculptural artworks for museums and public spaces. She has also been recently commissioned by the Amazon series Outlander to produce specialist glassware for the programme. Alasdair Gray is an award-winning Scottish writer and artist best known for his work Lanark: A Life in Four Books. By his own description: ‘Alasdair Gray is a fat, spectacled, balding, increasingly old Glaswegian pedestrian who has mainly lived by writing and designing books, most of them fiction’ (Canongate publishers). Meet the artist: Saturday 2pm to 4pm, 30 March. Siobhan will be in the gallery to discuss their work and new projects. Gracefield is open Tuesday to Saturday 10am to 5pm, admission Free and in Gallery 1 and the Café space you can also enjoy the exhibition by the Dumfries Camera Club – one of the busiest club in Scotland. Their annual show is always a wonderful reflection of the interests of amateur and professional photographers alike with wide selection of nature, portrait and landscape images. Visit the new arts and museums website at www.dgculture.co.uk or check out Gracefield’s Facebook and Twitter pages for lots of pictures of what’s going on and what’s coming up at Easter!